This section contains information specific to our male clients regarding dermal filler treatments. For more general information about our dermal filler treatments, see Dermal Fillers. Genetics, lifestyle and the passage of time eventually conspire to leave their mark on all of us. Skin loses its youthful, vital appearance and wrinkles begin to appear. We feel the same, but look older. Just when we should be hitting the peak of our careers, we may start to look past our best. Thankfully, there is a solution to help turn back the clock without resorting to invasive surgery. Dermal fillers are primarily composed of hyaluronic acid, which is a substance that occurs naturally in the body. Skillful injection of dermal fillers allow us to instantly reverse the process of ageing by replacing lost volume, fill lines and wrinkles and produce a healthier, energetic and more appealing look. Dermal filler treatment is available in the UK from botonics at our prestigous Harley Street clinic, in the heart of London’s private medical district. Your free consultation will be with the specialist that will do your treatment. Your medical history form will be reviewed to identify any treatment contra-indications. You can then discuss what you don’t like about yourself and treatment options for improvement using dermal fillers. You can view before and after photos of clients similar to yourself to get a realistic understanding of your likely outcome. If you’re suitable, have carefully considered the alternatives and treatment pros/cons, we are often able to do the treatment in the same appointment (although there is never any obligation to do so). A topical numbing cream is applied which takes 15 – 20 minutes to take affect, and then we do the treatment. Injections usually only take about 10 minutes or so. You’ll then be given some aftercare advice and you’ll be on your way! What is the atmosphere like during the appointment? The atmosphere is professional yet open and relaxed. There is no need to be apprehensive because our client base cuts across all ages, genders, ethnicities, educational levels and incomes. We’ve pretty much seen it all! Can I bring pictures of what I’d like done? Yes, by all means, please do bring along pictures as they are a very useful aid to the consultation. Some people bring along pictures of themselves when they were younger, which helps us more accurately and naturally reverse the signs of ageing. Some people bring in pictures of celebrities or people who’s features they admire. We’ll be honest with you as to whether or not what you hope for is realistic. Will dermal filler treatments make me look more feminine? Only if you want them to! There are very well defined differences in male and female facial proportions (e.g. cheek height and location, eyebrow arch and height, shape and fullness of lips, etc). Some of our male clients, especially those that are transgender or gay, prefer to feminise their appearance which we are very skilled at achieving. Other men just want to be the most masculine and best version of themselves, and we are very skilled at that too! Your preferences and objectives will be discussed in a discrete and open consultation with the experienced specialist that will treat you. How can I explain any bruising or swelling that occurs following treatment to my friends/work colleagues? Any bruising and swelling can be minimised by diligently following our precare and aftercare advice (www.botonics.co.uk/treatments/dermal-fillers/aftercare/). Otherwise, many men prefer to use the ‘dentist’ or ‘sports injury’ explanation if they wish to keep their treatments confidential. What dermal filler treatments are most popular with men? 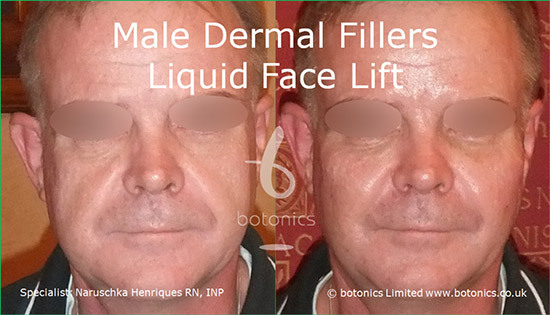 Every filler treatment we offer is of interest to and been done to men. The most popular treatments are things such as nose enhancements, tear trough, cheek enhancements, nose to mouth lines, pre-jowl sulcus (jaw line), lip enhancements, etc. We can refine your masculine good looks, make you look younger, or make you look more feminine if that’s your goal. Why do men have dermal filler treatments? The top motivations for men to have dermal filler treatments are as you’d expect: as a confidence boost and to look their best for career and relationships. Will people be able to tell I’ve had dermal filler treatments? We specialise in results that are dramatic yet natural. So often clients come back to us and tell us excitedly that their colleagues and friends told them they look great, but can’t put their finger on why. Win! Will it seem strange for a man to be in your waiting room? Absolutely not. Our waiting room is extremely discete, has plenty of men in it, and people visit our locations for a very wide range of reasons. No other people in the waiting room, or even our reception staff, will know WHY you’re there. Do straight guys have dermal filler treatments? Absolutely! We have male clients of all orientations – everyone is welcome! Your objectives will be discussed during your discrete consultation and we’ll respect your goal of looking masculine or feminine. Do dermal fillers cost more for a man? Our dermal filler treatments are priced the same for men and women, and are based on the volume of dermal filler required. Men do tend to have larger faces and deeper skin folds, so usually we need a bit more dermal filler for men than for the equivalent treatment to a woman. The cost of a recommended treatment will be clearly discussed before any work is undertaken. How long will dermal fillers last for a man? The duration of dermal filler treatments depends on a variety of factors, one of which is metabolism. As men tend to carry more muscle mass than women, dermal filler can tend to last a bit longer for the ladies. However, other factors such as lifestyle, diet, type of filler and location of injection play a greater role in filler duration. How many men have dermal filler treatment? Our client base is about 20% male and growing in proportion.